Go grab a big bowl of strawberries and enjoy their sweet juicy red goodness while you read about the benefits you’re giving to your body! Innermost part, which holds the seeds. Strawberries are actually flowers. That’s right, they’re a member of the rose family. They are enlarged receptacles of the flower. Even though strawberries aren’t berries, we still love them berry, berry much! Remember when we told you that one of the 10 Total Abandon Dental Health Lessons We Can Learn From The Young was to “sit and eat an entire bowl of strawberries, letting the red juices run down your chin?” There’s a reason why we chose strawberries as a great treat to over indulge on, and here’s five reasons why. Eating For Your Heart- When you bite into your heart-shaped flower, it’s a good reminder that you’re eating toward your heart health. They are filled with vitamin C and folate. Their compounds will help widen your arteries, which can prevent the buildup of harmful plaque. The vitamin C also boosts your immunity. Vitamin C in strawberries is also great for your skin. Vitamin C is vital to producing collagen. Collagen will improve your skin’s elasticity and resilience. Strawberries can help lower your cholesterol. The ellagic acid and flavonoids provide an antioxidant effect. This benefit can be great for your LDL (bad cholesterol) in your blood. Strawberries also have an anti-inflammatory benefit, which is good news for your heart! Feeling pain in your joints? Pop a strawberry in your mouth! Antioxidants and phytochemicals in strawberries can help reduce joint inflammation. Strawberries contain about 2 grams of fiber per serving. Fiber in your diet helps prevent constipation and diverticulitis (inflamed intestines). Fiber is also helpful in the fight against type 2 diabetes. They also help you maintain a healthy weight, which is a great defense against type 2 diabetes. 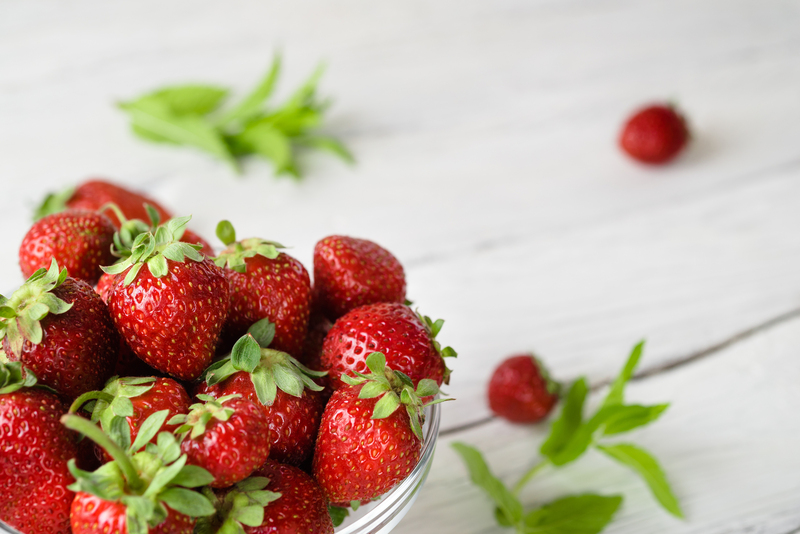 Strawberries are naturally low in calories, fat-free and low in sodium and sugar, so dig your teeth into them and enjoy! Here’s an easy recipe using two important, and delicious ingredients that will benefit your heart and health. The two ingredients you need are dark chocolate and strawberries. If you’re wondering how dark chocolate can be good for you, you can be happily surprised by reading about it here. Give your strawberries a bath in water and then make sure your strawberry is very, very dry before you give it it’s skinny dip into the dark luscious goodness. Melt your dark chocolate of choice with a double boiler or medium saucepan. Make sure no lumps remain and then remove it from the heat. Place a sheet of parchment paper on your counter to receive the strawberries and give them a place to hangout and harden. Dip your strawberries (one at a time) by holding the top stem and sending them for a dive into the chocolate. Allow the excess chocolate to drip off and place it on the parchment paper to cool and harden. Here’s the fun part (as if that wasn’t fun enough): drizzle your strawberries with white chocolate, nuts or sea salt to give them an extra fun member to invite to the party that’s about to happen in your mouth! Why not spend your summer eating yumminess for your mouth and your health. Pick up a bunch of strawberries at the market and enjoy! Les Belles NYC encourages all patients to live a vibrant, healthy lifestyle. We want a enjoy a beautiful life together by providing support for your healthy, happy and beautiful life.